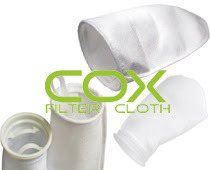 100 MICRON PE FILTER BAG, China 100 MICRON PE FILTER BAG, Quality 100 MICRON PE FILTER BAG manufacture by COX Filter Cloth. Weave Polyester filter bag available from 50 micron to 500 micron. Plastic, carbon steel, stainless steel, belt neck material is best select for application.